As mentioned in the previous installments, I have ranked the bowl games by category, with the major criterion being level of desirability to view, partly on my end, partly on the end of the average viewer who is NOT a certifiable college football addict like yours truly! To find a complete bowl game schedule where each game is found in order of date and time each game is to be played, go here. This third installment is of bowl games about which I am VERY interested (as usual, all times are Eastern Standard). Happy Kwanzaa (LMAO! I’m sorry, I just can’t say that with a straight face!). My [potential] “offensive explosion” bowl game for the 2012-2013 season. To paraphrase the guys at EDSBS, what’s better in a bowl game than seeing both teams’ offensive coordinators emptying the most shameful corners of their playbook? Better yet, it pits bears vs. bruins; how often does one see that in a bowl? Just sayin’! Yes, I’ll admit, I’m a bit biased. After all, I was part of the team that won the 1998 Alamo Bowl, arguably one of the more memorable games in the series. But that aside, the Alamo Bowl is always a good matchup. Is it quite as good as when it was Big Ten vs. Big XII? The realignment to a Pac-12 vs. Big XII matchup has not watered things down any, at least not yet. 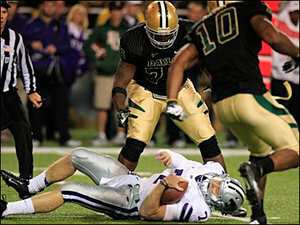 Remember last year’s offensive explosion between Baylor and Washington? That one is not soon to be forgotten, either. This time, the Longhorns are playing, which automatically makes it good. Granted, Oregon State is favored on paper, but do not underestimate Texas’ home field advantage, given that their campus is only a little over an hour away. Nothing like closing out the old year by watching a classic SEC-ACC matchup in Hotlanta! Of course, there have been plenty of such “classic” matchups on paper over the past several years, but they have usually amounted to rather one-sided affairs in favor of the Southeastern Conference. You’ll have that. After all, not all Peach Bowls, er, Chick-Fil-A Bowls can be like the Auburn-North Carolina game back in 2001! In any event, the funny guys at EDSBS have come up with three possible scenarios of how this one will play out (all with varying degrees of probability – refer to game ranking #6). I particularly like the “LSU blowout” scenario! My “great game that nobody is talking about,” for it pits two scrappy teams struggling for respect in their respective conferences. Better yet, it’s a very dramatic culture clash within the bowl season, for the only private school in the B1G meets, well, the “clanga-clanga” of cowbells. It also makes for an intriguing coaching matchup in one coaches favors the pass while the other favors the run. How can a viewer lose with this whole proposition? The matchup is intriguing on the surface alone. ­One side is a traditional blue blood, figuratively and literally. They won the first ever bowl game and gave birth to the college fight song as we know it today. Oh well, and Michigan also has the most wins of any football program, ever. The other side, South Carolina, is something of a late bloomer. A relatively late joiner of the SEC, for years they had been a conference doormat prior to the Lou Holtz and especially the Steve Spurrier eras. But this game is where the newcomer will take down the old guard, should everything work out on paper. Yes, that’s a rather dry way of putting it, but if I made any allusions that the Gamecocks should bury the Wolverines underneath the pavement for some horrified archaeologists to discover a century or two later, well, I might get accused of plagiarism, or something. First of all, let us get this out of the way right now and admit that this game is not quite as interesting as the Outback Bowl, but it’s interesting nonetheless. If Nebraska had their hands full against a 7-5 Wisconsin team at a neutral site, good Lord, what is the seventh-ranked Georgia squad going to do to them? Second, what on Earth are the Cornhuskers doing being ranked 16th in the AP after a such can of whoopass had been opened up on them in Indianapolis? All that being said, the only thing that Nebraska has going for them (and I mean the only thing) is that the Bulldogs are a senior-laden team that was underachieved all season, and be very, very aware of such teams when they show up in bowl games, as they are likely to disappoint. The good news for Wisconsin is that they caught Nebraska off guard during the Big Ten championship game and have earned a third-straight berth to the Granddaddy of Them All. The bad news for Wisconsin is that they must face a Stanford squad that is arguably more formidable than last year’s Andrew Luck-led team. The Cardinal can more than match the Badgers in the trenches, and that instantly takes away their competitive advantage. More bad news: barring the possibility of Stanford breaking out their black helmets and all-cardinal Nike Pro Combat unis, this bowl game will be the matchup of the generic uniforms. The good news for all of us is that we will be “looking live,” as ABC’s front line crew of Brent Musburger and Kirk “Herbie” Herbstreit will be calling the game, folks! Yeah, yeah, I know that I filed this upcoming game under “who’s bringing the body bags?” That’s my safe prediction. My less-than safe prediction, shared by others, is that Florida’s occasional quarterbacking ineptitude might align itself with Louisville’s occasionally vulnerable secondary. Of course, even if both of those things click simultaneously, it’s not that safe of a bet that the same clicking will occur between the Gator’s formidable defense against the Cardinals’ Teddy Bridgewater, as sad as I am to say. Then again, it is the Big Easy, and the Charlie Strong can always dial up some voodoo magic. Old conference rivals reunite in a relocated classic bowl game (used to be in, well, the Cotton Bowl, now it’s in Jerryland). What makes the matchup even more interesting is that the Aggies’ current head coach, Kevin Sumlin, was at one time an assistant under Sooners’ head coach Bob Stoops. That notwithstanding, in all likelihood the pupil will become the teacher. Oklahoma is another one of those teams about which to beware, that being a team with lots of seniors that has underachieved all year; rarely does a team like that come through victorious during bowl season. Moreover, during the later part of the regular season, Coach Sumlin was coaching A&M so well that it seemed as though they could beat anybody in the nation. With that being said, this will be a major test to see whether or not they can beat anyone in the postseason. On one hand, it is unlikely that Notre Dame has ever encountered any team with Alabama’s overall athleticism. On the other hand, Notre Dame has won lots of close games, and there is some skill to that. Ultimately, the game will come down to one of two things: will the Irish receivers be too much for the Crimson Tide’s secondary, or will Bama’s offensive line gradually take over in the middle of the third quarter? The result of the game will hinge on either contingency. Instant BCS Chaos: In just one night, the BCS standings have turned upside down. All Kansas State and Oregon had to do was win out, and they would have been matched up in a very intriguing national championship game in Miami. Scratch that; ain’t gonna happen. Oregon lost a close, hard-fought game in Eugene, Ore., to a tough Stanford squad. The game went into OT, and the Duck’s failure to score on their opening possession gave the Cardinal an opportunity to win the game with a field goal, which they did. Another one bites the dust. Yet half-way across the country in the heart of Texas (Waco, to be exact), something even more improbable developed. Kansas State, at that time ranked No. 1 in the land, went down to spectacular defeat at the hands of Art Briles’ Baylor [Baptist] Bears. The score itself was improbable: when is the last time any top-ranked team went down to an un-ranked team by a score of 52-24? Nothing accounts for that. Credit Briles and Co. with coming up with an amazing game plan that effectively attacked the Wildcats where it hurt them the most, and they never let up the entire night. Not in five years has there been such BCS standings chaos in one night of regular season football. Yet things get even more intriguing from this point onward. For the first time in 19 years, almost to the week, Notre Dame is the No. 1 team in the nation. No doubt plenty of rejoicing erupted in South Bend., Ind., instantly upon Kansas State’s defeat, and no doubt the merriment doubled again in light of Oregon going down at home in OT. After winning close game after close game, Brian Kelly has brought the Fighting Irish back to national prominence and is in the driver’s seat to punch their ticket to Miami come early January. Meanwhile, an entire nation will scrutinize Notre Dame to see if they themselves can stand prosperity as they journey to Los Angeles this upcoming weekend to take on traditional rival USC. And just like that, the SEC is back in the national discussion: Alabama’s upset at home to Texas A&M last week seemed to wipe out the Crimson Tide’s hopes of repeating as national title contenders. With last night’s, er, developments, despair has instantly transformed into renewed hope and ambition. Bama is now second in both the AP and USA Today Polls, and Georgia is no. 3. Should both those teams win out – extra emphasis on ‘should’ – it will be a very interesting contest in Atlanta for the SEC championship come Dec. 1. Dooley Fired: Not only is now-former Tennessee head coach Derek Dooley “Desperately seeking…anything.” Now he’ll be desperately seeking…a job. The University of Tennessee decided to cut its ties with Dooley after their embarrassing loss in Nashville to up-and-coming, in-state rival Vanderbilt, 41-18. The firing is effective immediately, as it has been reported on Tennessee’s athletics website that offensive coordinator Jim Chaney (with whom I worked while a student manager at Purdue, as he was an assistant under Coach Joe Tiller) will be the interim head coach for the upcoming game against Kentucky. Evidently, the powers that be are not giving Dooley a couple of curtain calls like those UK’s Joker Phillips has received. Yesterday’s embarrassing loss to the Commodores was just the last straw in one bad development after another for the program; the final blow to prove to the Volunteer nation that things need to be guided in a newer, better direction. This year alone, the Vols have gone 4-7, and 0-7 in the SEC, something entirely unacceptable to a large, proud fan base, to say nothing of a program with such massive tradition and resources behind it. In just one game shy of three complete seasons, Dooley is just 15-21 with Tennessee, but worse yet, 4-19 in the SEC, and 0-15 against top-25 opponents. Let us not forget that his hiring was essentially a stop-gap move in the wake of Lane Kiffin’s sudden departure for the USC job. Let us also not forget that under Dooley’s leadership last year, Tennessee lost their annual season-closer to Kentucky for the first time since 1984, and it is not a given that the Vols will Triumph over the Wildcats this year, either. Come to think of it, has Kentucky ever defeated Tennessee in football for two seasons in a row? Heisman talk: Quarterback Collin Klein of K-State was the Heisman frontrunner, but after his team lost ignominiously, and his performance was mediocre at best (27 for 50, 286 yards, 2 td’s but 3 int’s), could it be that “Johnny Football,” Johnny Manziel, himself of Texas A&M, is the new award frontrunner? Food for thought, in any case.